“The Madres” is perfectly timed to this #MeToo moment. The rolling world premiere, written by Stephanie Alison Walker, is part of the National New Play Network. It opened first in L.A., then moved to Chicago, and heads to Austin after its San Diego premiere. The “Dirty War” is raging in 1978 Argentina. People are being ripped from their homes—murdered, incarcerated or ‘disappeared.’ Before it’s all over in 1983, the military dictatorship will have killed somewhere between 10 and 30 thousand citizens. It’s the women who protest and speak out, taking enormous risks to march in the Plaza de Mayo every Thursday for years, up until today, demanding the truth about their missing children and grandchildren. These are The Mothers of the Disappeared, or Madres de los Deseparecidos. They are fierce and fearless. “The Madres” is the story of one family—three generations of women—a grandmother, mother and the missing daughter who’s eight months pregnant. Old friends—including a priest and a soldier—come to the house to visit. But they’ve become complicit with the grisly regime, and can’t be trusted. The grandma and mother lie to them, cheerfully entertaining, while silently seething. 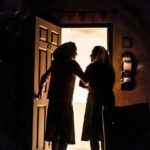 One of the greatest strengths of this Moxie Theatre production is the subtlety and nuance teased out of every thoroughly believable actor by co-directors Maria Patrice Amon and Moxie artistic director Jenifer Eve Thorn. Every one of the five compelling characters has a multiplicity of layers and loyalties. Each has something to hide, and their true emotions, roiling beneath the surface, occasionally emerge to reveal their fear, guilt or ruthlessness. The new play gets a bit didactic in the first act, but the final half hour is tense and intense, a powder-keg about to blow, one way or another. The design elements are strong, and the timely message comes through loud and clear. Brave women will come forward; they won’t cower. They’ll confront their tormenters, while marching and chanting ‘Nunca Más,’ Enough is Enough.